We were still in NYC, so for lunch we decided on E.A.T., a rather famous restaurant on Madison Avenue. 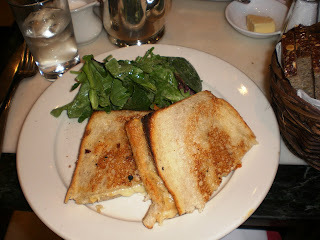 I had recently saw a special on them on the Food Network, toting their grilled cheese as the cheesiest in the country! As such, I ordered that while Jonathan went with the grilled ham and cheese. We were extremely impressed, and found it to be one of the best lunches ever. They were served with green salads and a strange dressing... I was expecting Caesar, but it ended up being more mustardy. There were plenty of breads served with the meal (sourdough, nutty, and raisiny), and the service was very good. It was a very good meal, but probably the kind of place you only go to on special occasion or to take tourists for a treat... aka it's pricey. We had planned on Italian food for dinner. I had the names and addresses of four places within three blocks of our hotel. But, as we walked back from sightseeing, another place caught our gaze: Saju Bistro. I'm not generally one for French cuisine, but the specials looked good, the aromas wafting out were delightful, and there was a pre-theatre menu that was reasonable. So, after we changed and grabbed the ticket information, it was down for dinner. It was fairly crowded, and we were asked if we made a reservation. We had not, but were still seated right away (there were several tables for two that weren't filled the entire time we were there, so I imagine they hold those for walk-ins during pre-theatre rush). The attentiveness of the staff was wonderful, from water refilling to taking plates away to the pacing of our dishes. While one of the specials (grilled scallops) sounded delicious to both of us, we each chose the prix fixe. Jonathan had a glass of wine (Argentinian Malbec), while I stuck with water. For starters, I had the mixed greens salad, Jonathan had Brandade de Morue (a baked dish of codfish and potato, served with toasted slices of baguettte). The salad was as stated, with a strange dressing. It was certainly dijon-based, but it may have been lemony as well, I couldn't quite place it. Jonathan's baked cod was wonderful. It was quite hot and blended with the potato and garlic beautifully. It was delicious, although I didn't try it paired with the baguette as Jonathan did. 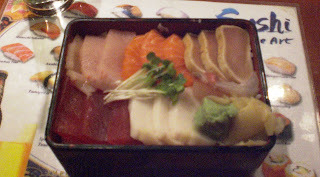 I chose the Saumon Provencal as my main course, which was an excellent selection. It was prepared medium with tarragon, and served with asparagus and tiny diced (and fried) potatoes. The grilled flavor on the asparagus was very good, and the potatoes were very flavorful, albeit a bit greasy. 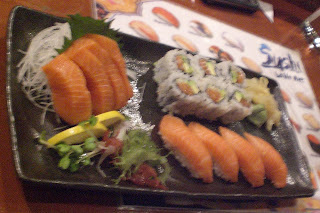 The salmon was served with half of a lemon, which added a light flavor to it... delicious. Jonathan went with Onglet a l'echalotte, aka hanger black angus steak. It came with potato puree (ridiculously fine, took out the flavor), a stewed tomato, and a nice shallots sauce. I wish I could replicate the sauce, as I enjoy shallots. The steak itself was enjoyable, although a bit different. He made room for all of it, which I was impressed with. Next was coffee and dessert. There were quite a few choices (more dessert options than appetizer options, LoL), I easily chose the chocolate mousse, while Jonathan thought for a moment before settling on creme caramel, a flan-ish dish. The mousse was plentiful and incredibly rich. Very good, and the homemade whipped cream topping it was delectable. I wasn't a fan of Jonathan's sweet, but he enjoyed it very much, particularly the sauce. The coffee was very hot, but with cream even I had some. The biscotti cookies were the best I'd ever had, but that's because they were closer to lady fingers, hehe. 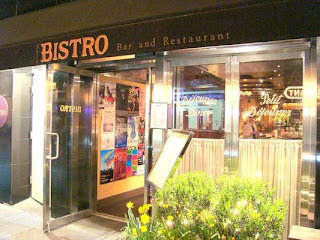 We'd both highly recommend the place, but be sure to go between 5 and 7 so you get the pre-theatre menu and discount! It's rather rare that Jonathan and I go out to lunch together. If we go out, it's usually for dinner (actually, breakfast out might be more frequent than lunch out for us... and we don't eat breakfast out often, either, LoL). But, since we volunteered in Trenton on MLK Day morning, we decided to see what lunch specials we could find. As I mentioned when we ate Villa Rosa, Carlucci restaurants are big here. In fact, there are two in the same plaza, and we never knew the difference. Turns out one is a sit-down, full-service place. The other is more of a take-out with a few dine-in tables available. We chose the latter, called Carlucci's Express. Everything on the menu looked good. Everything in the front display case looked good. Everything smelled good. I instantly decided on a chicken parm sub, while Jonathan wavered a bit before finally settling on a pepperoni cheesesteak. We ordered those (and a dozen garlic knots) to go. The place wasn't empty, yet we had our order in about five minutes, so service was awesome. We dipped into the garlic knots before we even got home (and we live maybe two miles away from this place). Fantastic. Garlicky, doughy, and even a hint of mozzarella cheese. Well done. I've had a lot of chicken parm subs in my day. In fact, it's safe to say that they are my favorite hot sub. I had them incredibly often during my first year of college in particular... I pretty much lived above a deli that was open until 3am, hehe. Anyway, this was a fantastic chicken parm sub. I'm gonna go ahead and name it #2 ever. The winner featured a more-toasted bread... this one was a little crisp, but more soft. Delectable. Jonathan thought his was good, and would get it again. I tried it, and it tasted like meat and grease to me... which means it's a cheesesteak, LoL. He even ate his whole sub in one sitting (half of mine waited patiently in the fridge for me until the next day). He's really excited about trying their pizza... it looked SO GOOD. Not only are they close... they're one of those places that often puts out coupons in the weekly flyer. AND they deliver. this has been an awesome find. I went and saw Kyla at work, then had lunch at CrepeMaker in Tradition. I'd like to completely recommend you go there. It's a small cafe, but it was absolutely delicious, fresh, and worth the price. I ordered a small chicken fajita crepe, and it was quite plentiful. I sat at the "bar" and was able to watch it being made. The workers were both very friendly. A great deal at less than $7! Everyone around me was eating other crepes (including the mouth-watering dessert crepes! ), and everything looked great. I might have tried a dessert one if I wasn't on my way elsewhere! On Christmas Eve, we had lunch with Heather at Shindig, a new Irish Pub in Port St. Lucie. It was great to see Heather, but the place wasn't impressive. We only saw one employee the entire time, so service was a bit slow. Said employee also seemed to be trying an Irish accent, but it came off as Swedish, so it was really weird. The food was nothing special for the most part... I had a chicken wrap (flavorless) with steak fries (boring and not recommended), Heather had the Shepherd's Pie (not the best she's had, but okay), and Jonathan had the Corned Beef and Cabbage (the cabbage was actually very good). Word to the wise: the menu reads as if there are multiple items qualifying for the "lunch special" but there's only one dish per day that counts.